The disposal of any type of waste always needs to be done in the most responsible way. Licensed rubbish removal companies offer many eco-friendly junk collection solutions to their clients and among them is a service known as skip hire. It comes with many great benefits and you can take advantage of it when you are decluttering prior to a house move, spring cleaning, organising your garage or in any other scenario in which you need to get rid of a large amount of rubbish. You can hire a skip that was specially designed to hold a certain type of rubbish category such as lightweight junk but you can also opt for one and use it to put all your unwanted items in it. You don’t need to sort through your junk. Just toss everything in the skip and let the rubbish collectors take care of it later. You are not ever required to put the waste into bin bags which greatly speeds up the rubbish removal process. Skips are available with a various height, width and length. They range from a 2-yard mini skip which has a capacity of 1.5 cubic metres and reach up to 40 cubic yard ROROs (roll-on and roll-off skips) that can hold nearly 30.60 cubic metres of rubbish. Well, not all junk collection firms offer their clients a wide skip selection but in most of the cases, the containers come in at least 3-4 sizes. Skips differ not only in their size but also in their type. 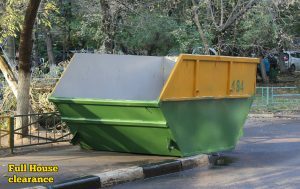 For instance, there are specialised enclosed skips which are ideal for the collection and transit of junk the access to which needs to be restricted for one or another reason (such as hazardous waste, construction materials, waste that may contain valuable items or important recyclables). There are also builder skips which are designed for heavy construction waste. Although there are exceptions to this rule, hiring a skip typically is cheaper compared to using a comprehensive junk hauling service. As a result, even though Full House Clearance’s reliable waste disposal services in Tottenham Green N15 are available at a very budget-friendly price, for some clients it will be even cheaper if they opt for a skip hire. This is due to the fact that with the latter service, the client does not really need to pay for any additional professional assistance, especially if they are doing all the junk loading alone. Let’s say that you are doing a house renovation and the waste in your backyard or deck area has been piling up for days. By opting for an effective skip hire service in London, you can have all the junk in one place. It is a convenient and risk-free solution which will be of great assistance to you when you are dealing with huge amounts of rubbish.